With student co-authors, this book chapter shares the impetus, background, origin, and sources of institutional support for Diverse Student Scholars, which is a predominantly undergraduate, interdisciplinary research program created and founded by the first faculty author. Along with offering student involvement details on the Diverse Student Scholars program, the relevance of institution-mission fit for undergraduate research is discussed. 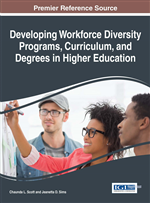 The authors summarize the Diverse Student Scholars program impact and connect student undergraduate research engagement with the potential for advancing workforce diversity competencies. In 1998, the Boyer Commission Report on Reinventing Undergraduate Education challenged educational institutions to improve spaces of learning in a manner that enhanced students’ abilities at writing clearly, speaking coherently, and thinking critically (“Boyer Commission,” 1998). The Report’s critique was targeted at America’s research universities, because “to an overwhelming degree, [these institutions] have furnished the cultural, intellectual, economic, and political leadership of the nation” (“Boyer Commission,” 1998, p. 5). However, these institutions, according to the Report, have failed their undergraduate populations. According to the Report, though world-class faculty researchers are marketed and publicized to attract and increase student enrollment, most students graduate from research universities without ever experiencing or contributing to this ground-breaking research. The Report argued that shifting dynamics related to education required the need to re-examine the common challenges associated with inquiry-based learning and with teaching effectiveness. Thus, the focus of the Report was not to rehash core curriculum but to re-explore how to infuse learning that would provide undergraduates with necessary skills (Sims, Lai, Shuff, Sims, & Neese, 2015) while capitalizing on the worth of a research university educational experience. Undergraduate research was posed as a remedy for this educational situation. The Report suggested changing the non-research-based norms of undergraduate education to research-infused places of learning. “There needs to be a symbiotic relationship between all participants in university learning that will provide a new kind of undergraduate experience available only at research universities” (“Boyer Commission,” 1998, p. 7-8). The major overhaul for undergraduate education offered in the Boyer Report included 10 recommendations, which began with a call to make research-based learning the standard. Since the Boyer Report, educational institutions have made strides in revamping undergraduate experiences to include research engagement (Hu, Kuh, & Gayles, 2007). And, students have been the primary beneficiaries in the process. Research engagement has enabled students to make contributions to their disciplines, to have greater choice in their careers, and to produce more impact on their society (Taraban & Logue, 2012). Students have also been able to clarify their choices in degrees and academic programs along with improve analytical and critical thinking abilities (Webber, Thomas, & BrckaLorenz, 2013). Just as the Boyer Commission has called for an elevated outcome from educational institutions, companies have issued a challenge for universities to graduate career-ready professionals in the area of workforce diversity (Bowen, Kurzweil, & Tobin, 2008). And, the recent call from Scott and Sims (2014, 2015) suggests workforce diversity career development is still lacking among academic degree-granting institutions. Existing workforce diversity curriculum in the Academy has not kept pace with business demand, especially in terms of providing transformative learning opportunities for university students (Sims, Scott, Lai, Neese, Sims, & Barrera-Medina, 2014). share a blueprint for faculty and institutions seeking to cultivate greater undergraduate research emphasis.